We’d love your help. Let us know what’s wrong with this preview of School by Craig Herbertson. To ask other readers questions about School, please sign up. It was not a bad book, but I can't say that I loved it. It felt like someone telling me their dream. It felt very personal and that the author could see and feel everything about the story they were telling, but it didn't quite get through to me in that way. I'd say it was more of a compatibility problem with me, rather than a fault of the book. The descriptions were never quite enough for the setting, the characters, the atmosphere etc to leap off the page. It dabbled in some interesting issues It was not a bad book, but I can't say that I loved it. It felt like someone telling me their dream. It felt very personal and that the author could see and feel everything about the story they were telling, but it didn't quite get through to me in that way. I'd say it was more of a compatibility problem with me, rather than a fault of the book. The descriptions were never quite enough for the setting, the characters, the atmosphere etc to leap off the page. It dabbled in some interesting issues, but it didn't really go deep enough (possibly due to it being a children's book, but it really barely dipped its toe into certain pools). I didn't think Jean was a particularly strong lead and I found his thought processes and speech frustrating and unlikable. Craig Herbertsons' short stories such as New Teacher, Spanish Suite and Leibniz's Last Puzzle have been regular highlights of recent Black Book of Horror's and other anthologies, so I was delighted to get hold of a copy of his first and to date only novel length work. School: The Seventh Silence follows the adventures of Jean Deforte. Jean is half french which already sets him aside as an outsider at school, creating classroom difficulties but these are the least of his problems. Left at an Engli Craig Herbertsons' short stories such as New Teacher, Spanish Suite and Leibniz's Last Puzzle have been regular highlights of recent Black Book of Horror's and other anthologies, so I was delighted to get hold of a copy of his first and to date only novel length work. School: The Seventh Silence follows the adventures of Jean Deforte. Jean is half french which already sets him aside as an outsider at school, creating classroom difficulties but these are the least of his problems. Left at an English school while his mother attends his fathers deathbed, it's only his sister Michelle, or Papillion who he can really relate to. His siters disappearance, which may be linked to a string of child abductions in the area, is the straw that breaks young Jean, sending him spiralling into an alternative world. Jean finds himself in a school populated by a completely different set of problems. Here amidst a world of talking statues, mating books and even a white rabbit are dangers of a different kind, monsters which threaten to consume him. 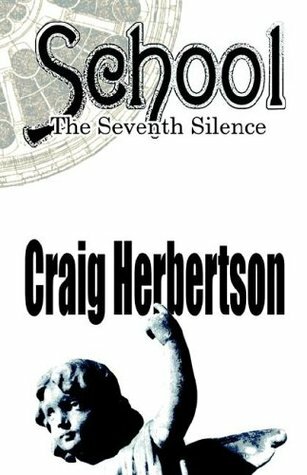 Craig Herbertson has created a marvellous fantastical adventure with a deep and dark undercurrent in School. Ostensibly similar to Carrol's Alice stories with it's dark fantasy adventures, it also invokes Peake's Gormenghast with it's bleak, crumbling buildings and morbid characters. It's more adult in tone than the former though and asks some real questions of the reader on the themes of childhood isolation, family bonds and exclusion. In a lesser writers hands this could have led to a clumsy piece of work but in Herbertson's hands it becomes an original and engrossing adventure. Despite the difficult concepts at play the writer manages to get and keep the readers attention even when faced with the most bizarre and grotesque scenes. The clarity of the writing is also illuminated by the authors excellent line drawings which intersperse the story. Problems really only revolve around the ending which comes at a rush and also leaves the story unfinished, I know the author has other books planned in the series but as these have not yet been published it's down to the reader's imagination to fill in any gaps. There is also a strange tone at points in the story which almost take it into children's book territory e.g. the monsters after Jean are known as Goobleys, yet despite the childish name they are frightening creatures. I think this is a deliberate attempt to reach the innocence of the child in what is clearly an adult story and for me it didn't detract from the otherwise serious tone. I was born in Edinburgh. As a youth, I tried a few different career paths: labourer, clerk, gardener, salesman, barman, doorman. I was the singer and songwriter in the punk band, the Androids. I played Querelle in an avant-garde Mime Company for three years, performing a controversial adaptation of Genet’s novel banned by the Scottish Kirk. These occupations betrayed a similar pattern: Initial ent I was born in Edinburgh. As a youth, I tried a few different career paths: labourer, clerk, gardener, salesman, barman, doorman. I was the singer and songwriter in the punk band, the Androids. I played Querelle in an avant-garde Mime Company for three years, performing a controversial adaptation of Genet’s novel banned by the Scottish Kirk. These occupations betrayed a similar pattern: Initial enthusiasm, bemusement, claustrophobic terror. Europe beckoned. I hitched from the southern tip of Spain to the northern flats of Holland with a fiver sewn in my jacket, worked the Paris Metro as a busker and bottled Cafes in the south of France, Belgium and Holland, picked grapes near Perpignon, swam naked in mountain pools. It was fun being young. I settled down in Manchester where I became a street trader. I sold coats, watches and virtually anything cheap. Sometimes the watches worked. Later I stewarded on the Oil Rigs in the North Sea. I then found my music again. I taught myself fiddle, banjo, mandolin, penny whistle and piano. Unfortunately, after some good times in various folk duos, I lost it again. I became a Philosophy and Sociology teacher in a Manchester grammar school where I rediscovered my innate horror of authority. After my marriage failed, I ditched it all. I played banjo in Irish bars in Savannah, Georgia, Jazz bars and Riverboats in New Orleans. Then left for Germany where after a period of solo work in German kneipen I arranged the songs for, and toured with, the Dance Spectacular ‘Celtic Life’. Latterly, I joined the traditional band Scapa Flow and was lucky enough to get a Folk CD into the BBC Indie Charts in 2004. This provided much amusement for my teenage kids but ultimately, failed to pay the rent.